In Convening and Thanksgiving - part 1 I wrote about the "Inner Game" of convening and how I tend to follow the convening wheel to lay the groundwork for a Thanksgiving gathering of family and friends. I've been doing this internal work of learning to know myself better, clarifying my intentions and appreciating the gifts of my guests for weeks. 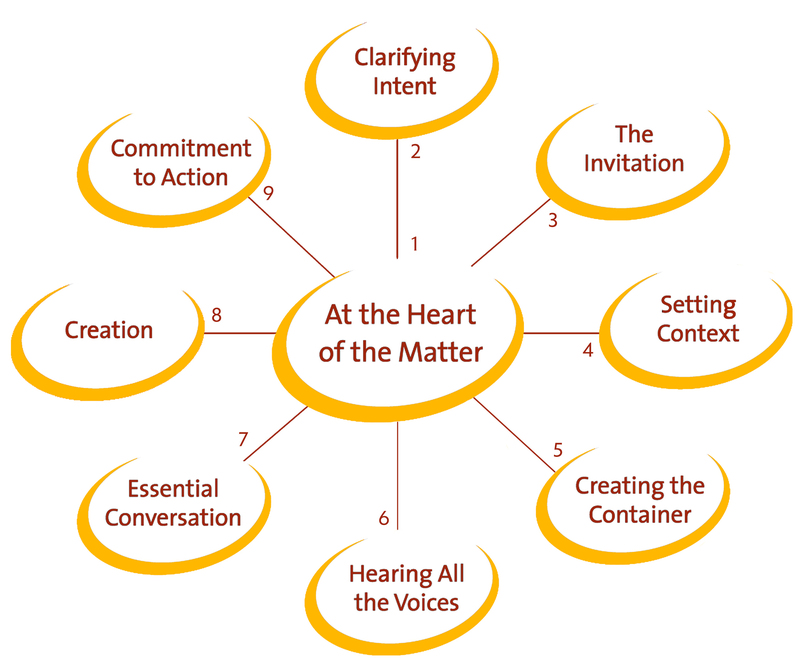 I covered the parts of the Convening Wheel: At the Heart of the Matter, Clarifying Intent and The Invitation. There are 6 more Aspects of the Convening Wheel. Another part of the inner game for me is to think about what we're going to do together and share my thoughts with those who are coming. I equate this to Setting Context (Aspect 4) for my gathering. I don't send an "agenda" for Thanksgiving, but I share with everyone what time I expect them to come and whether or not I expect them to bring something. Also, I share what we'll do first (usually gab), second, etc. and (very important) what's on the menu and what time we'll eat! Sometimes it doesn't seem necessary to do this (we've been doing Thanksgiving gatherings all our lives! ), but I find that the tone is much more relaxed when everyone comes knowing what to expect. I Create the Container (Aspect 5) by decorating our environment with candles and something pretty on the table. I like to have everyone at the same table in my gathering - even if we have to stretch extra card tables into the living room! As I said in part 1, I've gotten into the habit of creating place names and putting them around the table - but people can also trade places if they'd like. The important part is to let everyone know they are welcome. In my Thanksgiving gathering, once we are at the table, I Hear All the Voices (Aspect 6) by asking each person to say one thing they are thankful for. Sometimes someone will also bring a writing that we take turns reading out loud. The first time we did this felt somewhat awkward, but now it seems as if everyone is used to it, expects and enjoys what we say to each other at this time. While conversation is pretty free and enthusiastic among us, it is more rare to have an opportunity to be heard by everyone at the same time and to listen intently to everyone else. Mostly my guests and I engage in Essential Conversation (Aspect 7) as a matter of course. We like to talk, laugh, tell stories and listen. Usually the games and breakout conversations begin after dinner. Sometimes we get a good rousing game of Apples to Apples going! I don't have an outcome I'm looking for except to authentically engage at my gathering so I have yet to see the ways that Creation (Aspect 8) and Commitment to Action (Aspect 9) may enter into my Thanksgiving. If I think about it some more it might come to me, but for now, I'm going to get to bed and get up early to put the turkey in the oven. The point I want to make in this Thanksgiving series is that the principles of The Art of Convening are not only relevant and useful in business and organizations, but they apply to all kinds of gatherings. As I said in the book, The Art of Convening is a great gift to me because of the way it has helped to generate an atmosphere of good will, intimacy and trust in all kinds of settings. Cynthia (Cindy) Wold is a co-author of The Art of Convening: Authentic Engagement in Meetings, Gatherings and Conversations. Thanks for posting Cindy. It's interesting to me that I'm often more shy about being intentional at family gatherings than I am in my professional meetings. One stumbling block is that there are often implicit rather than explicit roles. Your article gives me something to ponder about how I might engage more intentionally this year.